Last month I found myself, together with A and S, in a little village in Quintana Roo, 2 1/2 hours by bus and a short ferry ride away from Cancun. There I knew we could walk barefoot through town, swim in the water at sunset, and wake at sunrise to an empty beach. When you unload your luggage from the bus, the drivers of the Tricitaxi Syndicate are waiting to transport it the 50 steps down the dock to the ferry. There are no cars, so most people get around by golf cart, the two-stroke, burning-oil kind, not the most eco-friendly means of transportation. The golf-cart versus the island, this is how it starts looking after a while. Last year when we were here, we hired a cart ourselves, drove north-east out of the village along the beach, to the point where the sign prohibited motorized transport, but the road continued, and so did the little buggies. This year, there was no sign, and a sand road instead, weaving its way between the shore, where the turtle emerge and the line of mangroves, where they lay their eggs. 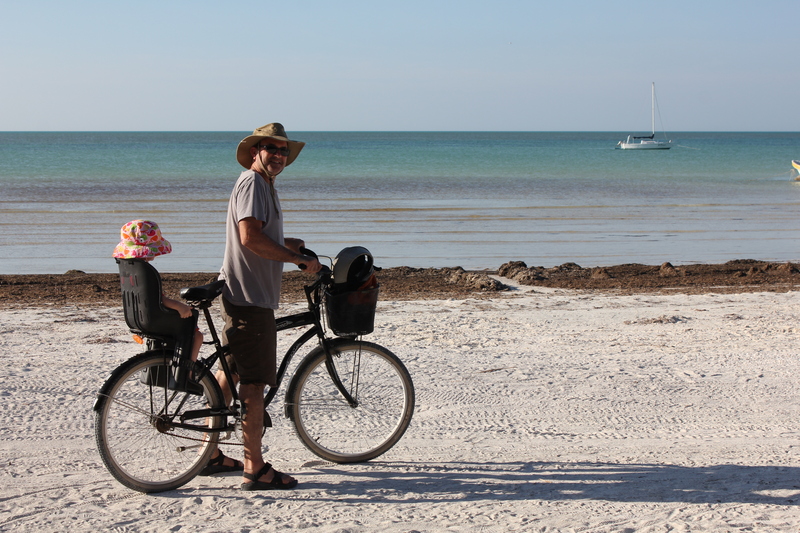 We had rented bikes, and S loved the long ride next to the shore, watching the water from the vantage of the child seat. Waterfront property costs as much as houses in Toronto. Meanwhile two worlds struggle alongside one another. The tourists feed a strong local economy of elite landowners and a proto-suburban population (if you can use that word where there is barely even an urb), while the staff serving the hotels and restaurants are their neighbours. And many villagers have come from more drug-ridden and violent parts of Mexico to make a safer life for their families. Will Cancun ever come here? Will they start raking the rotting weed from the beach so as not to offend more delicate noses? Perhaps it is true that the ground won’t hold the pylons needed for the big hotels. But if the ground doesn’t protect itself, the Mexican Minstry of the Environment SEMARNAT (Secretaría del Medio Ambiente y Recursos Naturales) probably won’t protect it either. 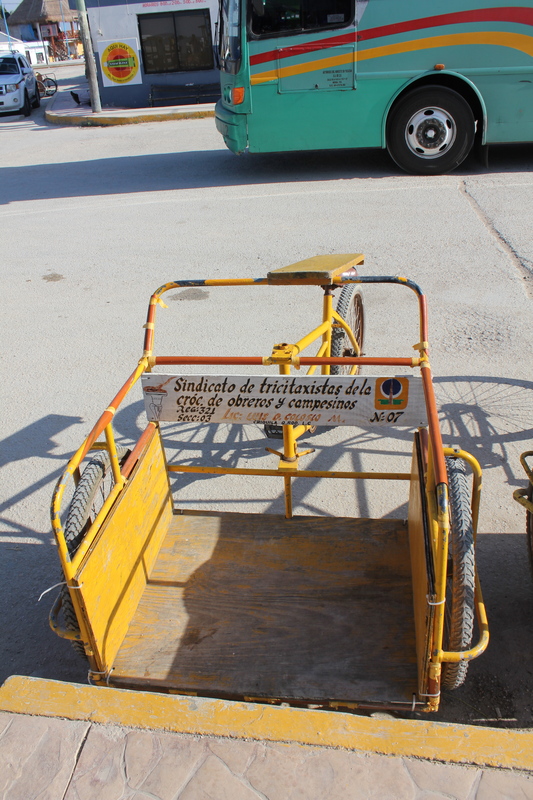 This entry was posted on Monday, March 26th, 2012 at 6:31 pm	and tagged with Cancun, environment, golf carts, Isla Holbox, mexico and posted in Uncategorized. You can follow any responses to this entry through the RSS 2.0 feed.